Migration watches; 06.30 - 13.30hrs and 15.15 - 18.00hrs. With an improvement in visibility and a change in the winds attention was turned to the sea in the hope of a good seawatch, and what a good seawatch it was with two additions to the year list. 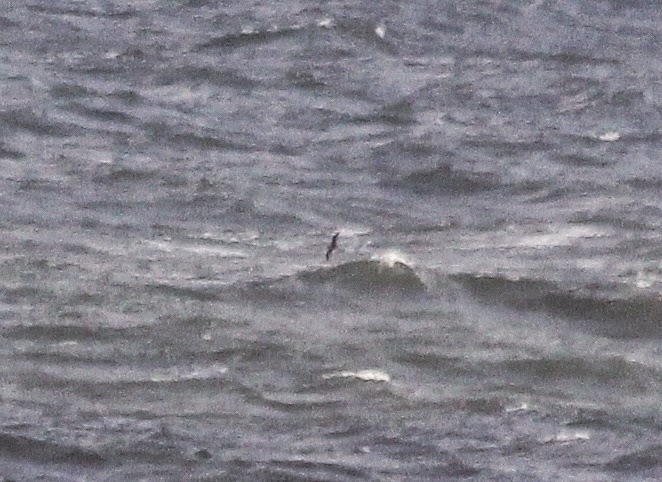 The clear highlight was a FEA'S (type) PETREL which flew north past Long Nab only about 5-600 meters offshore from 09.43 - 09.47hrs, after being seen at Flamborough and Filey. 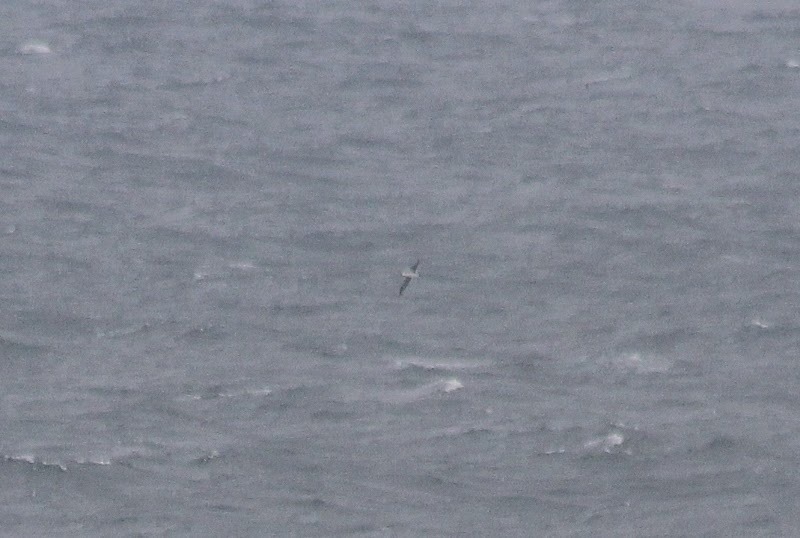 This is the first record of Fea's Petrel for Scarborough, the 4th first this year, and took the year list on to a respectable 225. Also past Long Nab during the day (north unless stated) were 2 Red-throated Diver + 31 south, 57 Fulmar + 1 south, 143 Sooty Shearwater, 77 Manx Shearwater, 760 Gannet, 1 Cormorant + 3 south, 2 Dark-bellied Brent Geese, 3 Wigeon, 1 Mallard, 1 Pintail, 17 Eider south, 14 Common Scoter, 1 Velvet Scoter, 2 Oystercatcher south, 1 Curlew south, 3 juvenile Long-tailed Skua at 10.30, 13.21 and 16.43hrs, 11 Arctic Skua + 5 south, 3 Great Skua + 5 south, 1 Pomarine Skua, 1 adult Sabine's Gull seen feeding with Kittiwakes at 15.55hrs before heading north (the 226th species for the year!! ), 7 Black-headed Gull + 1 south, 5 Common Gull, 2 Lesser Black-backed Gull, 92 Kittiwake + 5 south, 1 Sandwich Tern, 4 Common Tern, 5 Arctic Tern, 1648 Auk sp, 9 Puffin, 1 Rock Pipit south and 1 Grey Wagtail south. Migrant numbers had again decreased but were also much harder to detect in the strong winds, between Long nab and South Cliff were 6 Kestrel, 7 Wheatear, 5 Whinchat (South Cliff), 1 Redstart, 2 Whitethroat, 2 Blackcap and 3 Chiffchaff. Elsewhere an Osprey was seen at Ellerburn Trout Farm, 8 Egyptian Geese, 8 Wigeon, a Shoveler, a Pintail and 2 Mediterranean Gull (1 adult + 1 1st winter) were on Wykeham South Lake where 4 Ringed Plover flew west, 12 Grey Heron, 22 Wigeon, 5 Teal and a Shoveler were on Johnson's Marsh, 59 Oystercatcher, 1 Bar-tailed Godwit and 5 Redshank were in Jackson's Bay, 2 Dunlin and 5 Sanderling were in North Bay, in the Harbour there were 31 Turnstone, a Ringed Plover and the first two returning Purple Sandpiper of the autumn and 2 Little Gull were seen in Cayton Bay.